Files can become corrupt and be damaged in such a way that it is impossible to access their contents. This can be a real problem, but when this happens you can resort to File Repair, a program capable of recovering all kinds of corrupt files. 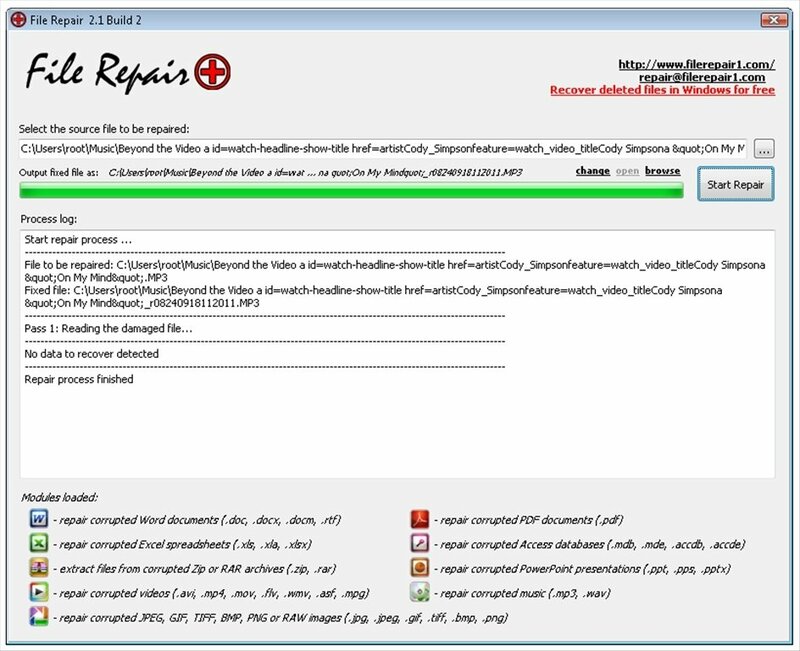 Recover corrupt file from a large variety of programs and formats: Word (DOC, DOCX, DOCM, RTF), Excel (XLS, XLA, XLSX), Access (MDB, MDE, ACCDB, ACCDE), PowerPoint (PPT, PPS, PPTX), compressed file (ZIP, RAR), video files (AVI, MP4, MOV, FLV, WMV, ASF, MPG, JPEG), images (JPEG, GIF, TIFF, BMP, PNG, RAW), PDF documents and music (MP3, WAV). Valid in case of electricity cuts, network interruptions and virus infections, errors with applications or shared networks. Quick file recovery, only requires two steps: locate the file and recover it. File Repair is an advanced recovery tool that, as you will be able to see, doesn't make any differentiation between formats. In all cases it will try to obtain the maximum amount of information from the corrupt files to create a new file that is free of any type of problem. Unrecognized formats, impossible to read file, inaccessible file or that can't be opened by applications, memory or resource errors... No matter what the problem is, download File Repair for free and you will be able to recover the corrupt files.